Your brand is no longer defined by one marketing message, but rather the daily interactions customers have with the brand. Brands today realize in an effort to differentiate with customer experience they need to go above and beyond with service. You can’t talk about customer service without talking about the technology that’s driven customer service for the last 30 years. Namely, customer relationship management (CRM) technology. 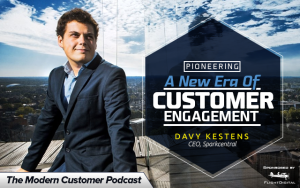 According to Davy Kestens, CEO of Sparkcentral and this week’s podcast guest for The Modern Customer, there are multiple misconceptions about the CRM space. CRM has become sales process optimization or automation software. Companies looking to leverage customer data for other reasons find themselves in a lurch. For many large enterprises CRM is the place where data gets dumped. With the repeated dumping of data, many large companies find their customer data unusable. The CRM space has bloated itself with many players with varying use cases. According to Kestens today’s CRM is not living up to its expectations. This is why it takes so long to get help with you contact the contact center of a company. While you are on hold the agent is flipping through 15 different tabs. Kestens predicts in the future brands will be engaging in a battle of customer experience. But today’s brands are a long way from there. Podcast guest Davy Kestens was called the next Aaron Levie by Forbes Magazine. Today his company SparkCentral has a clientele featuring the world’s largest brands including Delta, T-Mobile, Uber, Lyft, Lululemn, Dropbox, Arby’s and Emirates. Listen to our podcast to learn more about what he is doing to pioneer a new era of customer engagement. Disclosure: Sparkcentral is a client of Blake Morgan’s company Flight Digital.